Building activity around Walmart on 20th Street is fulfilling Indian River County’s intention to have a lively mix of commercial and residential development in the area; the comprehensive plan lays both zoning types side by side on the map. The 10-acre parcel is zoned R-6, which allows up to six single-family homes on an acre, but Indian River County Planner Ryan Sweeney said it is very difficult to attain that density and also conform to green space, interior road, stormwater containment and other requirements. About three homes an acre will be achieved at Bridgehampton. 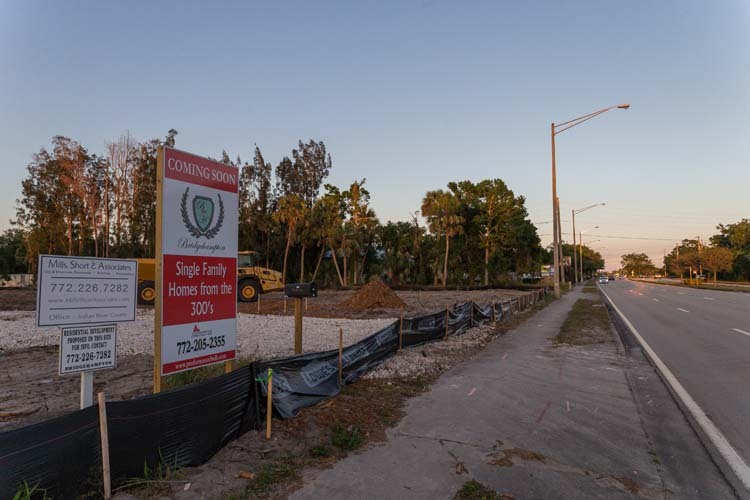 The owner and developer is Chris Heine of North Palm Beach, who is also responsible for The Gardens at River Grove, a 39-home development a few blocks south at 2010 46th Ave. Heine is also the developer of Legend Lakes, a 160-home community near 43rd Avenue and Oslo Road. He bought the land Bridgehampton land from the Brackett family in June 2016 for $870,000, according to the county records. A sign at the site says homes will be built by Proformance Construction but that arrangement is off and Heine said he has hired Passage Island Homes of Vero Beach to be the builder at Bridgehampton, having worked with Jim and Paul Adams on other projects, he said, when they owned Ameritrend Homes. The engineer on the project is Mills, Short & Associates, also of Vero Beach. The long, narrow parcel has about 330 feet of road frontage. There will be one road going in and out of the development, with access directly off 20th Street, which is also Route 60. The county is not requiring off-site traffic improvements. Cars turning in will come to a gated entrance, with 6-foot-high buffer hedges on either side running parallel to Route 60 to shield the community from the sight and some of the sound created by traffic on the busy road. The planners put two stormwater ponds at the front of the development, adding further distance between homes and the road. Five-foot-wide sidewalks will be built on each side of the center road that will be edged with a low-profile “Miami curb” that’s good-looking, easy on car tires and provides good drainage. Keith’s Oil Can is to the east of the development and Lake Park Subdivision, dating from 1953, is to the west. Sweeney said the preliminary plat was approved about two years ago, the first step in a three-part process. Bridgehampton is amidst the second step, having been granted the land development permit approving construction drawings for stormwater, sewer, landscaping and roads. The development will get final plat approval after passing final inspections for infrastructure. “The final plat is the legal document that is recorded and creates the lots and rights of way,” Sweeney said, which is needed before lots can be sold to prospective homebuyers.